The company run by Solihull entrepreneur Lord Aleem is threatening the world’s most famous mixed martial arts star with legal action over standing on its Rolls-Royce. The Irish UFC star used the car from Birmingham-based Platinum Executive Travel, run by Aleem with his father Saleem, while partying in Liverpool during the Grand National. However, after one of his own Instagram posts saw Conor McGregor pictured standing on the bonnet of a luxury car, the Liverpool Echo reported Platinum bosses were not happy. Aleem posted a picture of himself, also on Instagram, standing on two cars saying he could stand on them – because they were his. The ultimate fighter was warned he could face legal action by the firm which has become known for supplying celebrities. The car in question is believed to be a £240,000 Rolls-Royce Wraith. A spokesman for the Midlands-based company told the Echo it was concerned about damage and considering whether to take legal action. The row first came to light when social media personality Lord Aleem – real name Aleem Iqbal – posted an angry response to McGregor’s post. Platinum Executive Travel also said it would be looking into the conduct of the chauffeur who was hired with the car. 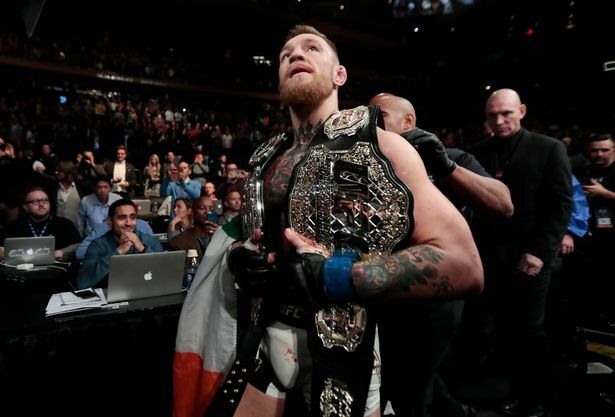 Conor McGregor leaves the octagon with his title belts after knocking out Eddie Alvarez. The company spokesman, who did not confirm how much deposit had been paid for the vehicle booked by McGregor, said the professional fighter would not be welcome to book through them again due to “the level of disrespect” he had shown. The company allows people to book out chauffeur-driven luxury and supercars, including Rolls-Royces, Ferraris, Porsches and Lamborghinis.